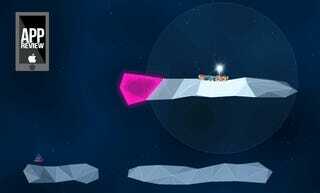 I'd never heard of the game Kiwanuka prior to my regular Thursday afternoon App Store shopping spree this past week. Now I can't stop talking about it. That I even dropped the $1.99 asking price on CMA Megacorp's physics puzzler is strange — normally I pick up the games I've heard of, download anything new and free and skip any paid unknowns to help keep my gaming app spending under control. There was just something about Kiwanuka's app icon, a blocky little character with a nearly featureless face, that called to me. Normally that impulsiveness backfires on me, and I wind up with another lingering caveat in my iTunes library. Not this time. No, this time I was rewarded, with a delightful physics puzzler with an offbeat, sometimes dubsteppy soundtrack, stylish, uncomplicated visuals and a simple gameplay mechanics that takes me back to the early days of the classic Lemmings franchise. The player is cast as the savior of the Kiwanuka people, charged with delivering them unto salvation using nothing but their wits, a sense of timing, and a lightning-spewing staff that's the key to the whole damn thing. Using said staff the player can create towers of Kiwanukans, topping them to traverse treacherous terrain. Take this early level, for example. The player creates a Kiwanuka tower and lets it fall to the right, hooking around to attach to a safe grey wall, avoiding pinkish-purple danger. The Kiwanuka leader can then traverse this living bridge, falling safely next to the prism holding one of the thirty imprisoned Kiwanukans captive. It's so brilliantly simple, this living tower mechanic, that on several of the game's 30 levels I found myself what was actually a simple solution — keep in mind that the towers can fall either way. I certainly didn't, but by the latter levels, when things like timing begin to matter, I was well prepared. Each level completed adds another Kiwanukan to the pile, unlocking the next sign-related puzzle unit all 30 are stacked high. It's incredibly difficult to stop before you've freed them all. I'd say Kiwanuka is a hidden gem, but it's right there on the front page of the iTunes App Store's gaming page, as well it should be. It takes a special game to distract me so completely during a busy weekend. It takes a truly special game for me to randomly tweet special messages when prompted. Kiwanuka is a pretty damn special game.